Following last year’s successful Ride to Conquer Cancer, which saw Krikke Motorsport team manager Ryan Krikke join three other riders in a 175-kilometre bike journey to raise money for cancer research, Krikke has once again decided to embark on the challenge, this time with a bolstered team of 12 riders. 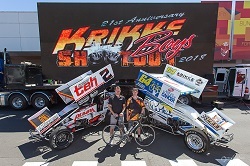 After being approached by Sprintcar driver Paul Peet last season, Krikke was more than enthusiastic about participating in the ride to raise awareness and much-needed funds for a cause that is close to his heart, with his brother Shane having lost his battle with cancer in June of 2016. With the 175-kilometre trek taking place in the day leading up to next month’s Krikke Boys Shootout, commencing at the South Perth Foreshore and concluding at the Bunbury Entertainment Centre, the team managed to complete the ride in a little over seven hours, raising a whopping $31,853, which was donated in full to the Harry Perkins Institute of Medical Research. Hoping to achieve the same result if not better this time around, eight new riders, which include Sprintcar drivers, team owners and crew members, will join the original four riders in putting their bodies on the line in support of cancer research. “Cancer has or will touch us all during our lives; it’s an insidious disease that will always be a terrible burden to whoever contracts it,” commented Krikke. Once again taking place prior to the Krikke Boys Shootout, which will be held on the Saturday night of March 2 at Bunbury Speedway, the 175-kilometre Ride to Conquer Cancer will take place on the Friday of March 1. For the team to achieve their goal of completing the ride in under seven hours, they will need to maintain the challenging speed of approximately 27.5 kilometres per hour throughout the duration.